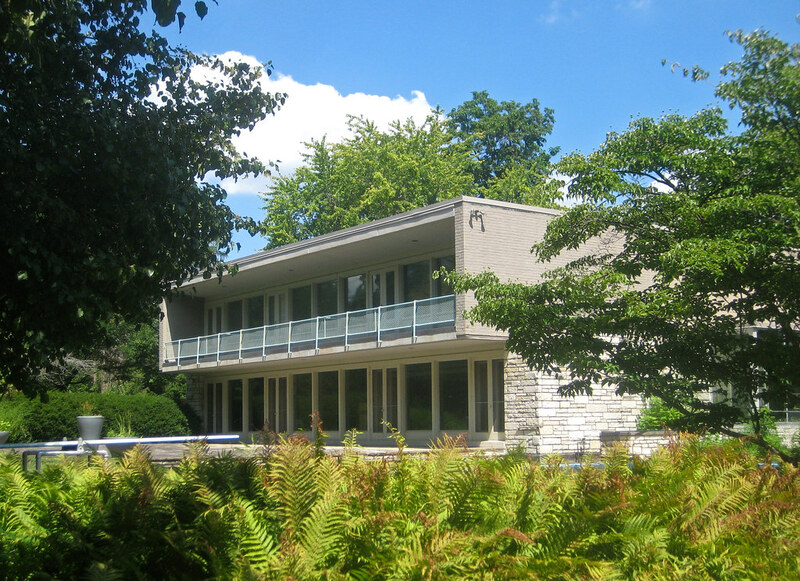 The International Style home at 12 Brentmoor Park was built in 1952 for Morton D. May, president of The May Department Stores Company. 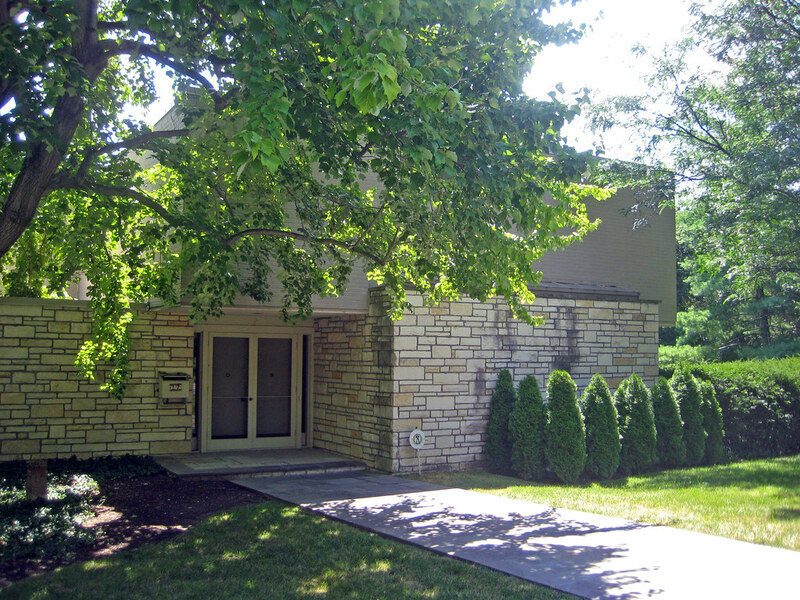 The home was designed by the architectural firm of Fischer-Campbell with a 1956 addition by Frederick Dunn. 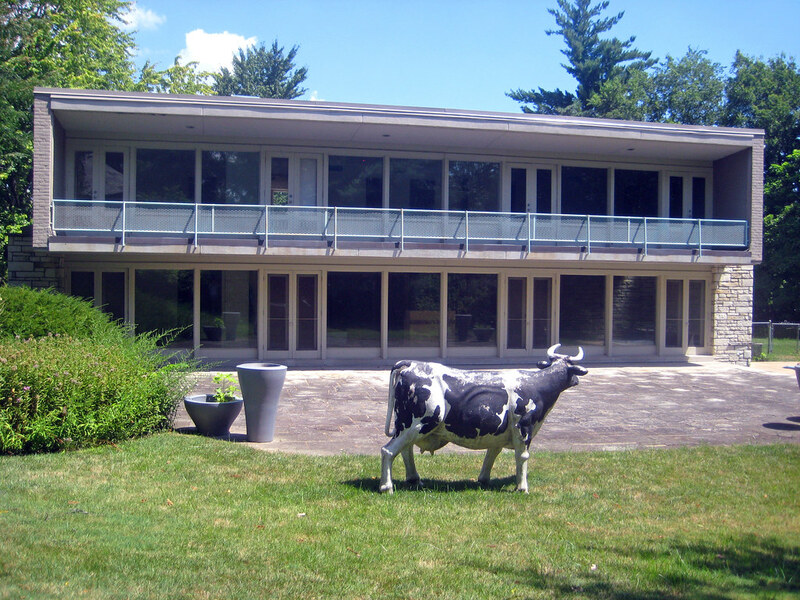 The home has been for sale for several months now (not sure if the holstein is included), but I was recently made aware of the fact that it is being advertised by Gladys Manion Real Estate both for its potential to restore a mid-century masterpiece or as a tear-down! The advertisement describes the home first as an asset to renovate but then does an about-face with: "Alternatively, this 1.39 acre flat lot would be an idyllic setting for your new dream home. 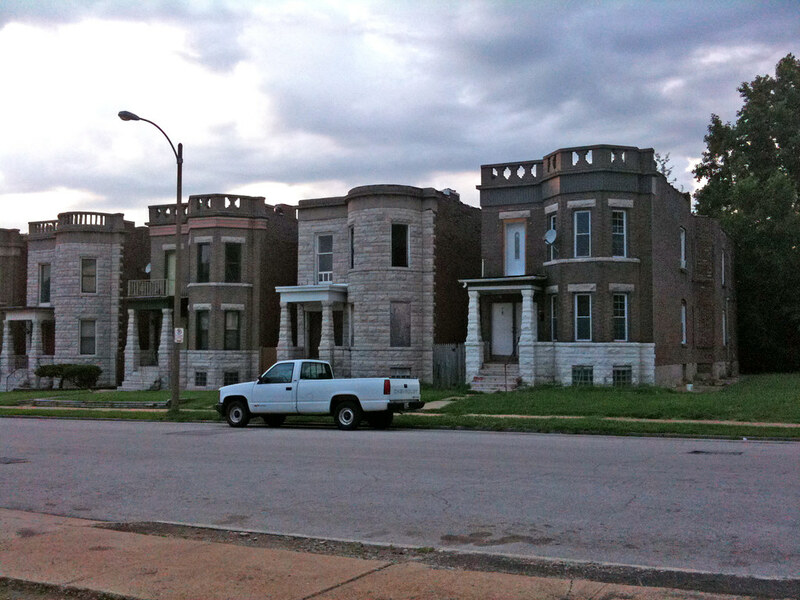 Limitless potential in one of St. Louis' most desirable, centrally located neighborhoods". 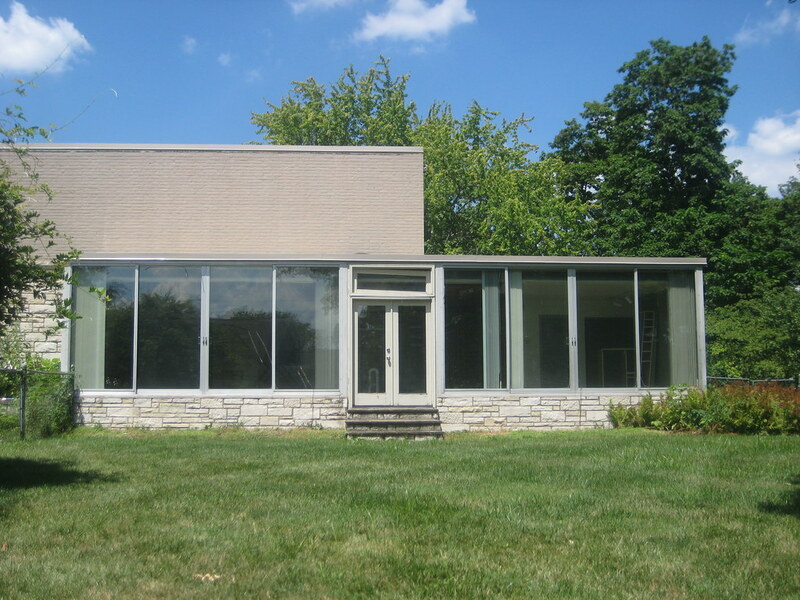 You may recall that May had commissioned Architect Samuel Marx to design a larger International Style home on Warson Road in Ladue in 1941. This exquisite estate was demolished in 2005 and replaced with an over-bloated fake French chateau which turns its back side to the large meadow that May's home was designed to overlook. To even think that this house has even the remote possibility of meeting the same fate is maddening! I was made aware of the potential peril of this unique house by artist Riha Rothberg, who now resides in New Mexico, but remembers the Brentmoor home from when the Mays lived there. Rothberg explained that she was momentarily "in the Twilight Zone" looking at my photos of May's demolished home on Warson Road since there were many features that are strikingly similar to this residence including the entrance shown above. 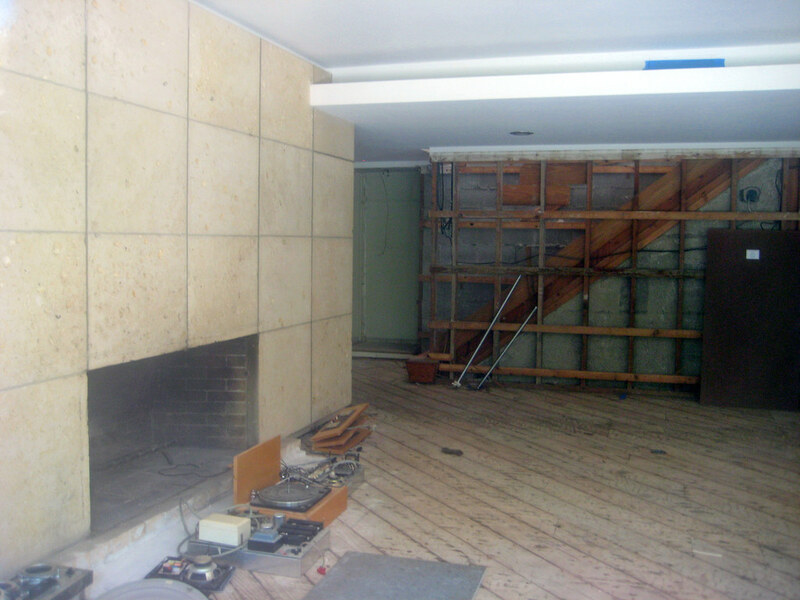 The living room fireplace also bears resemblance to that of May's former home. The stairs beyond to the second level however are very ordinary when compared to Marx's exquisite floating helical staircase that greeted visitors upon entering the Warson Road residence. The east wall of the living room is bathed with light from a feature unique to this home, a narrow linear skylight that occurs where the first floor base of the house pushes out beyond the rectangular second floor form which cantilevers over the terrace to the south. The west end of the house has the same feature (see to the right of the entrance above). 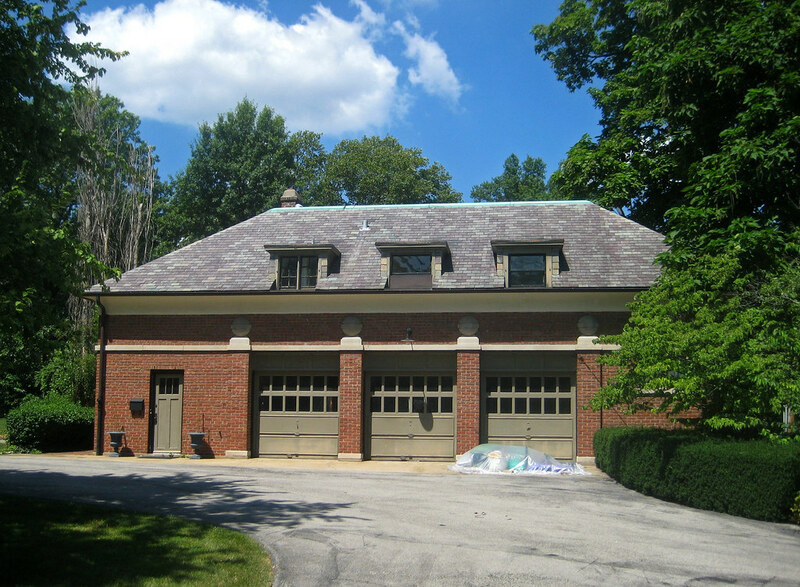 The property also includes this large garage/ carriage house. This was was part of 11 Brentmoor, designed by Howard Van Doren Shaw in 1912 (the property was divided to build #12) Morton D. May's father Morton J. May, who was a co-founder of the Muny Opera, lived at number 11. The carriage house has an L shaped wing of living quarters off the back with its own small courtyard. The ensemble would make a very nice guest house to compliment the modern residence. 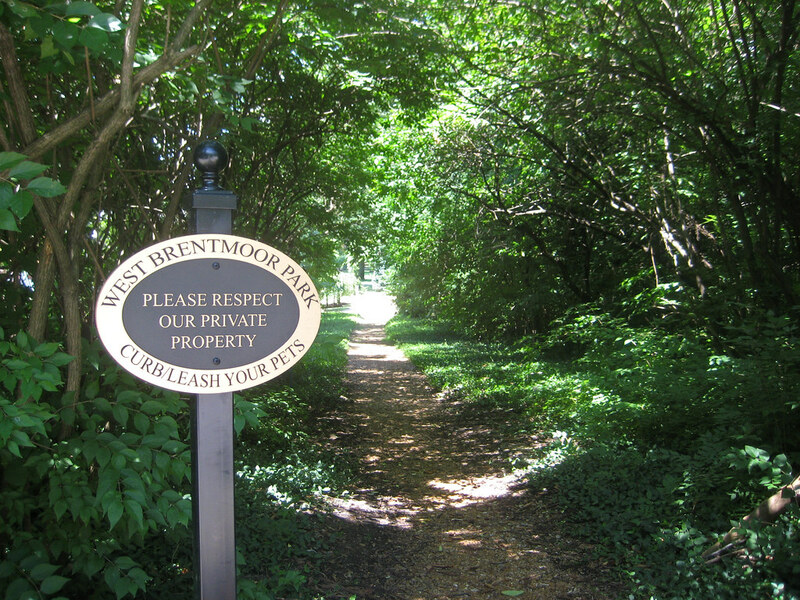 The more things change, the more they stay the same: This "secret" path still connects Brentmoor and West Brentmoor allowing residents to walk between the neighborhoods. 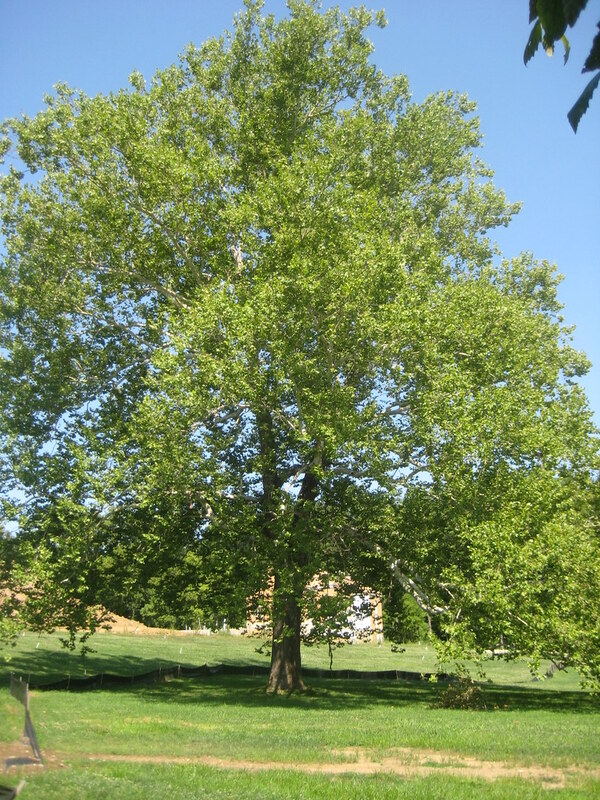 Brentmoor, West Brentmoor and nearby Forest Ridge across Wydown encompass a National Register Historic District which makes a renovation the Morton D. May residence eligible for Missouri's 25% Historic Rehabilitation Tax Credit. UPDATE: While still listed as a potential tear-down, at my request, the agent for Gladys Manion added that the home is in a historic district and may be eligible for historic tax credits. 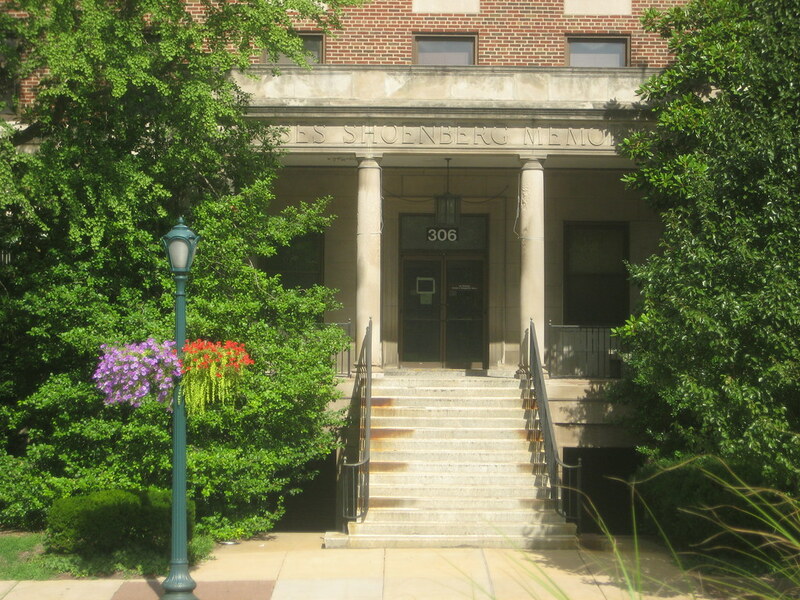 This week the staff of the Cultural Resources office recommended withholding at this time approval of BJC's proposed demolition of the Shoenberg School of Nursing on Kingshighway at Parkview Place. Here is the full staff report. BJC is proposing to demolish the building and replace it with an open plaza until a new building is built on the site several years from now. The Kingshighway entrance to the building. One thing that would likely be lost with a new building is an entrance on Kingshighway. Most of the newer buildings with the exception of the emergency room have entrances facing the smaller side streets or Euclid. The building is not overly unique structure as compared to say the McMillan Building, the former Shriner's Hospital, or C. I. D. Buildings, but it is a decent example of early 20th century classical revival design. It was an obvious influence to the Kingshighway elevation of Children's Hospital. 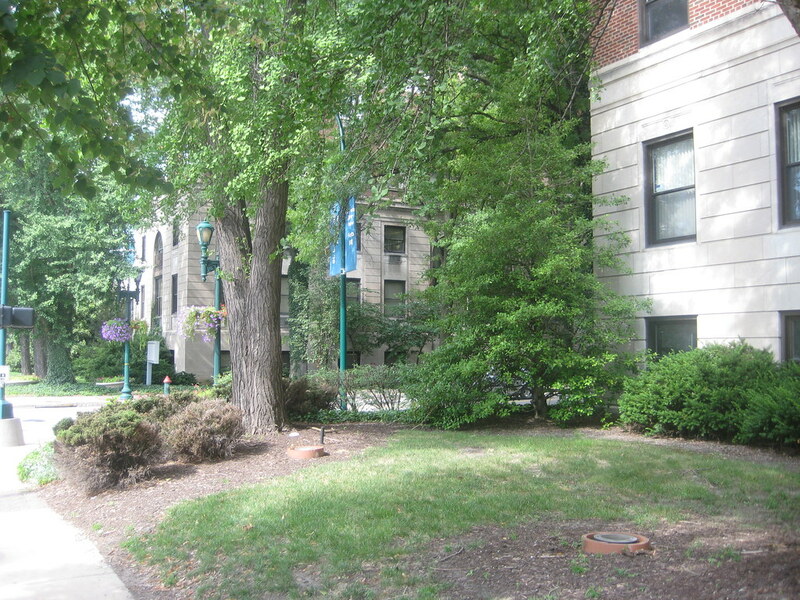 More importantly however is the fact that the building is an important component in one of the more urban and highly visible high-rise street walls in the central corridor that extends from just north of Highway 40 at the former dogleg of Kihgshighway (now called Hospital Plaza) to the Park Plaza at Maryland Avenue, with the notable exception of the parking lots between West Pine and Lindell. 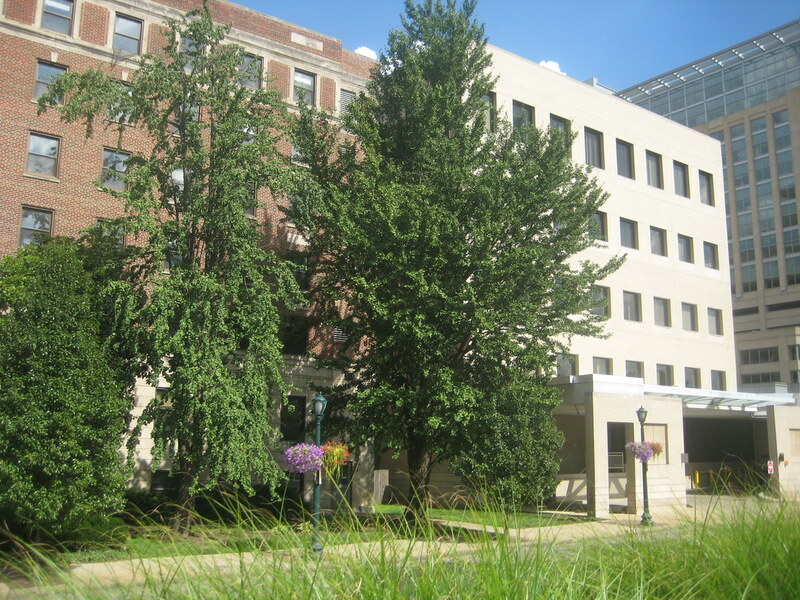 Like the Jewish Hospital Building north of Parkview Place, The Shoenberg building is set back slightly from Kingshighway and is fronted by a row of mature trees giving a very comfortable pedestrian atmosphere along the busy boulevard which has no street parking on the east side. Along Parkview Place the H shape of the building becomes visible above the balustraded ground level and the the scale is equally pleasant along the street. 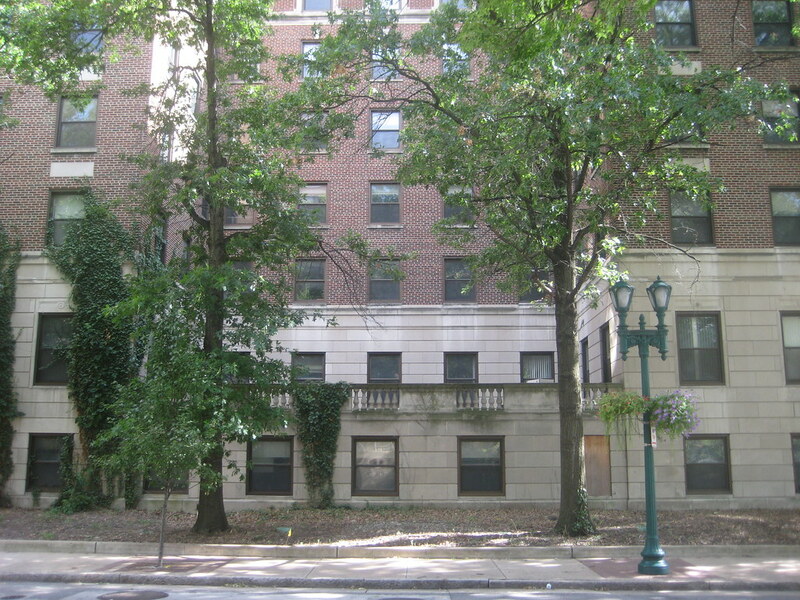 Just East of the Shoenberg building along the south side of Parkview Place is the back side of Children's Hospital. The street at this point is treated like a back alley with the massive blank wall and louvers. Demolishing the Shoenberg building now would open a gaping hole in the Kingshighway street wall and expose an equally blunt building facade that faces a small alley between the buildings, something that should be avoided for an indeterminate amount of time. Hopefully the Preservation Board will agree when they meet on Monday. 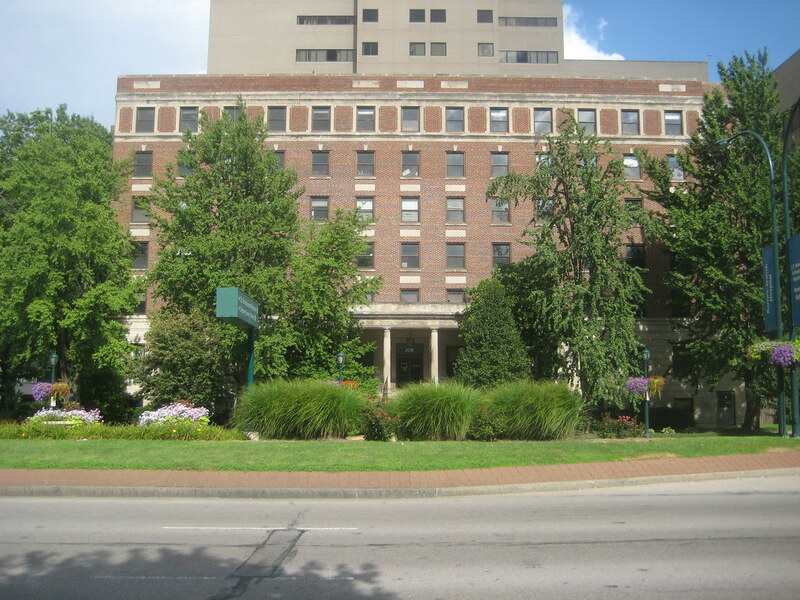 I am not opposed to the eventual demolition of the Shoenberg building if it is replaced immediately with an attractive new high-rise structure in the name of advancing medicine and keeping St. Louis competitive in the constant race to keep the medical center one of the top rated in the country. The new building however must address both Kingshighway and Parkview Place in a manner that is complimentary to pedestrians and bikers. What is Bowood Farms up to Now? I was heading home from the Contemporary last night and on a whim decided to take Olive out to Kingshighway. When I got midway between Taylor and Walton, I noticed what looks like the back of a demolition in progress over on Washington. 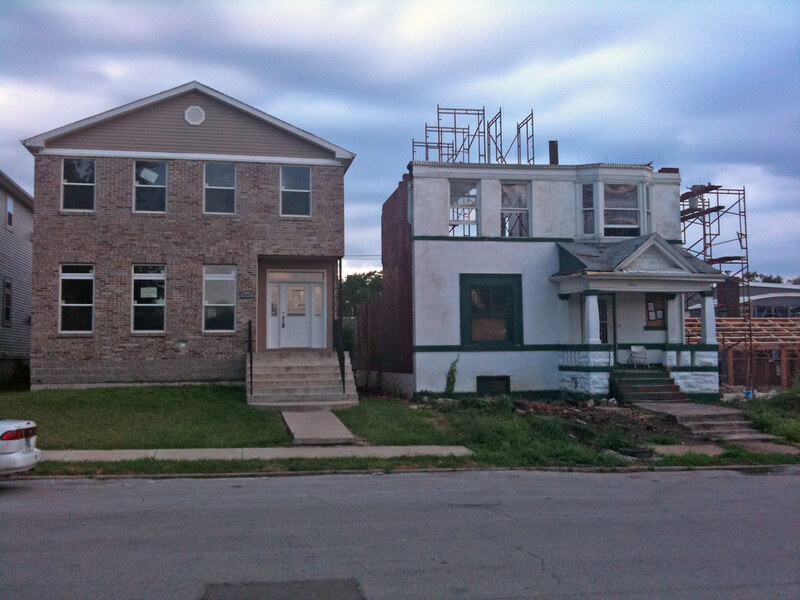 I went around the block and sure enough, 4604 Washington has been decapitated and is the entire back half has been removed. 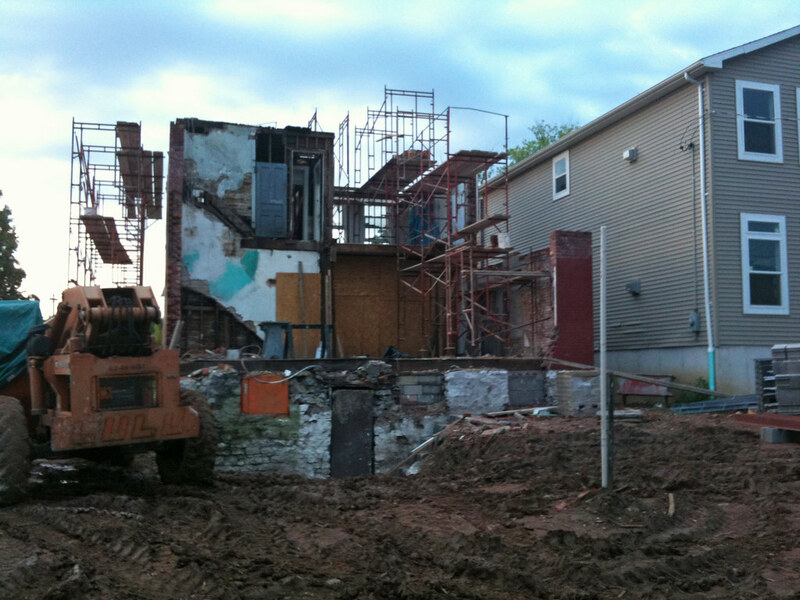 This is what the house looked like in spring 2009. 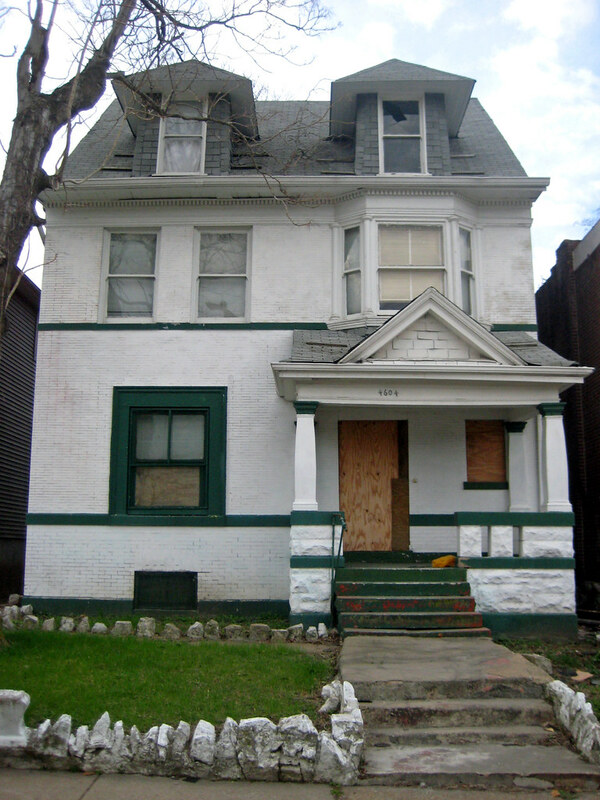 You may recall that the owner of this home, Bowood Farms, demolished the home just west at 4608 Washington. At the time, there was speculation as to what would happen to the neighboring 4604. Just to the east of 4604 Washington is one of two in-fill houses that were built a few years ago. While the houses are very plain, they at least match the massing of the exiting homes. As with most new houses though, the sides and rear are vinyl siding, so exposing the west side to the street would be very unfortunate. 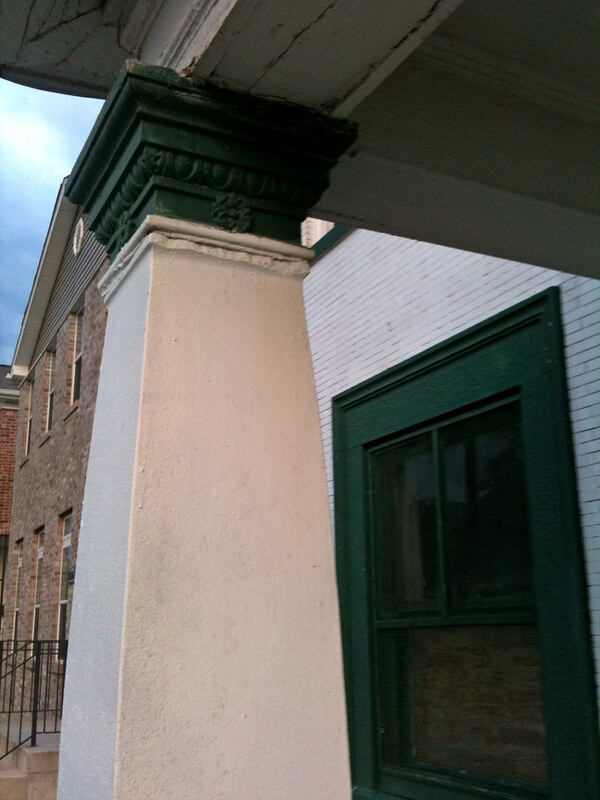 Detail of the stone porch columns at 4604 Washington. 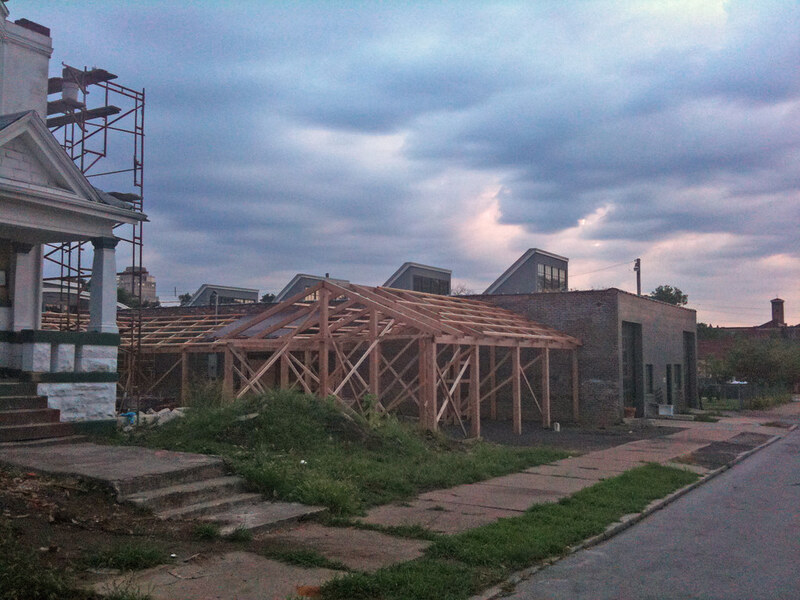 Bowood is constructing a sizable new wood structure attached to the former auto shop on the corner. This is at least filling the gap that was another vacant lot between the auto shop and the houses. 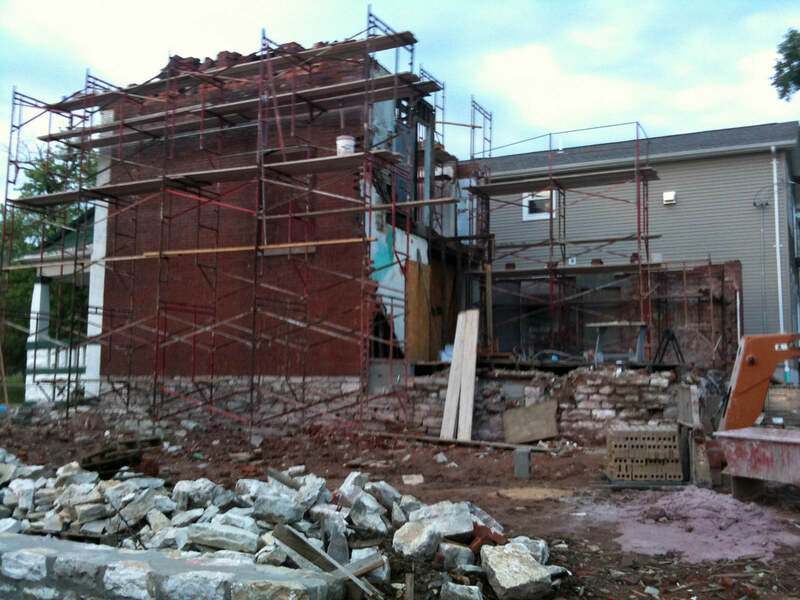 The foundation of 4608 Washington remains and part of it has been re-pointed and incorporated into the new structure. 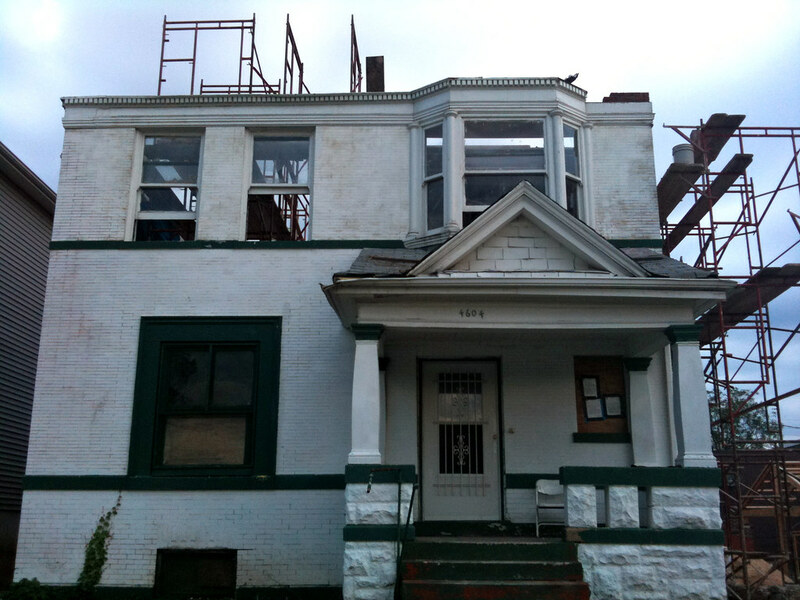 The permit on posted on the front of the house states that it is for demolition and structural stabilization. It does appear that possibly the front portion of the house might be retained, although work at the top of the wall makes it somewhat ambiguous. As for "structural stabilization", that is something I usually associate with a building that say has a collapsed roof, a missing wall or other structural defect. 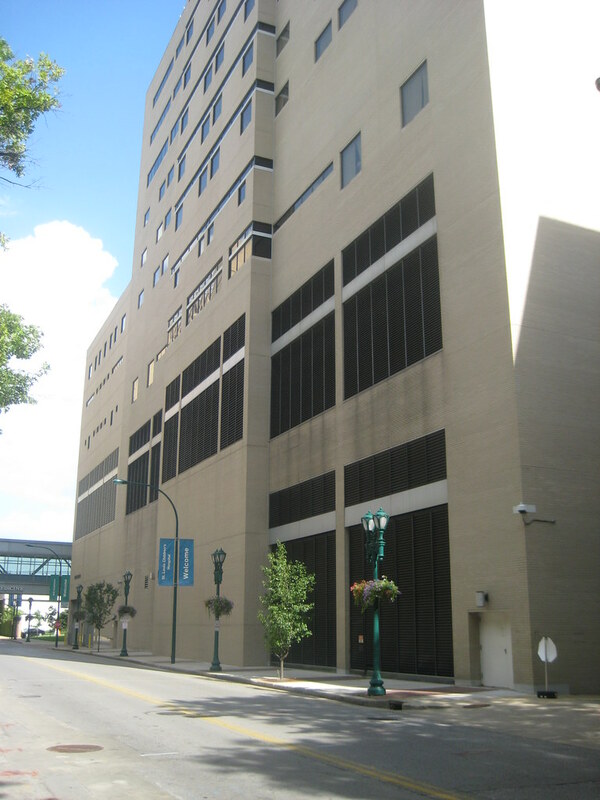 Another larger example of "structural stabilization" is what Pyramid and Craig Heller had to do to Lafayette Square's M-Loft building (pan down half way through the post) before it could be rehabbed into apartments. To my knowledge, 4608 Washington had no structural issues. A rear shot shows a new plywood wall across part of the first floor, hopefully another sign that part of this house will be retained. 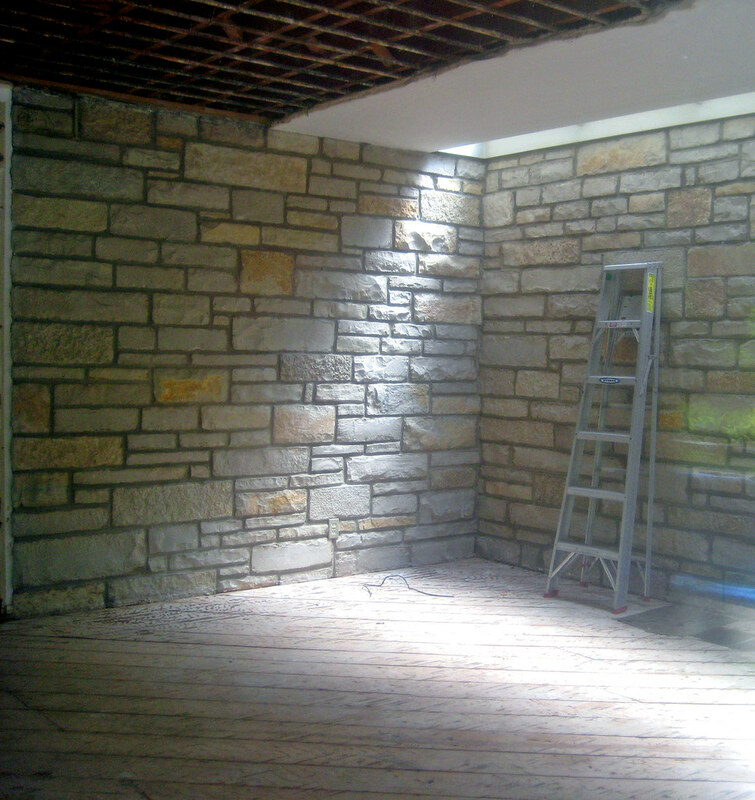 While not preservation in the truest sense, incorporating a portion of the house into something new could be very interesting and not result in a gaping hole in the block. If anyone knows the plans, please share. Across the street 4621 Washington, which is also owned by Bowood still has its upper windows wide open to the elements. With torrential rain like we had tonight, the entire front part of the interior of this house is surely ruined. Not exactly a great way to preserve a house that they claimed they will renovate, and also not a way to be a good neighbor in general. 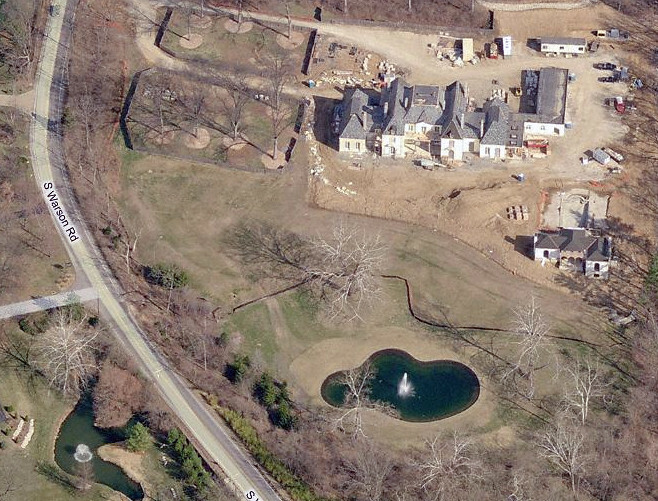 This monstrous fake French chateau is what has replaced the International Style Morton D. May residence on Warson Road in Ladue that was demolished in 2005. 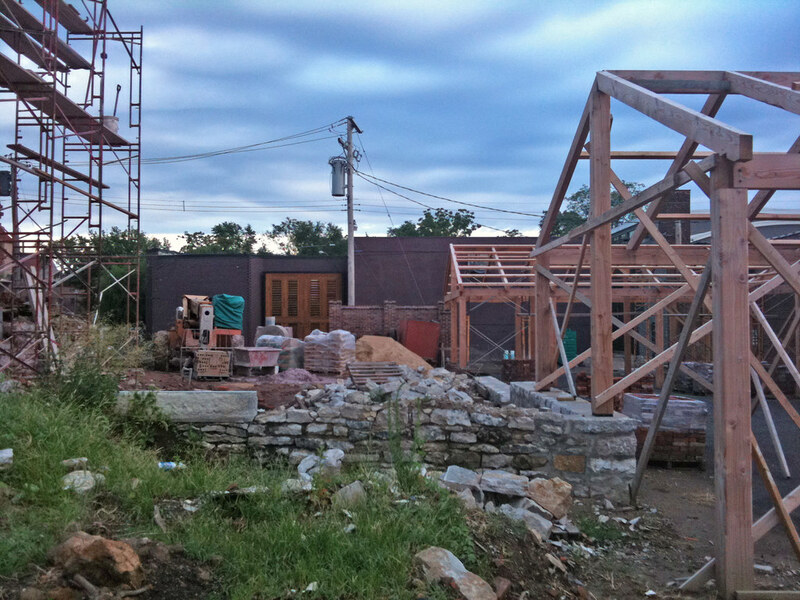 The McMansion was completed last fall, shortly after I took these photos. I realized recently that I never posted them. Heres a link to my photos of the unforgettable original 1941 Samuel Marx masterpiece. A closer shot reveals that while this house no doubt cost millions to build, it's exterior consists largely of cheap fake stucco (exterior insulation & finish system or EIFS). This great material can be found gracing just about every new Walgreens, CVS or other the front of many other big-box "category killer" strip mall stores across the country. An aerial view of the complex. I wonder how long it will take snow to leak through the roof along those long deep valleys? This lone tree in the middle of the rolling meadow is all that seems to be recognizable as part of the landscape of the former May residence. For some reason I was drawn to it repeatedly as I filmed one of the last days of the homes existence. 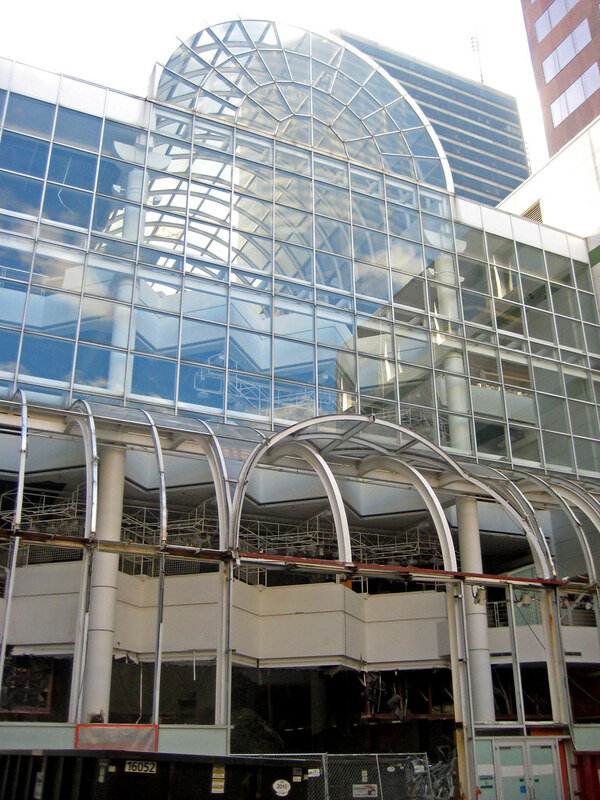 Recently I had lunch with one of the developers of the re-construction of St. Louis Centre. I asked what was was going to happen to the the one remaining large sign over the mall entrance at 6th & Washington, and he said that he was not aware that anyone was going to save it. 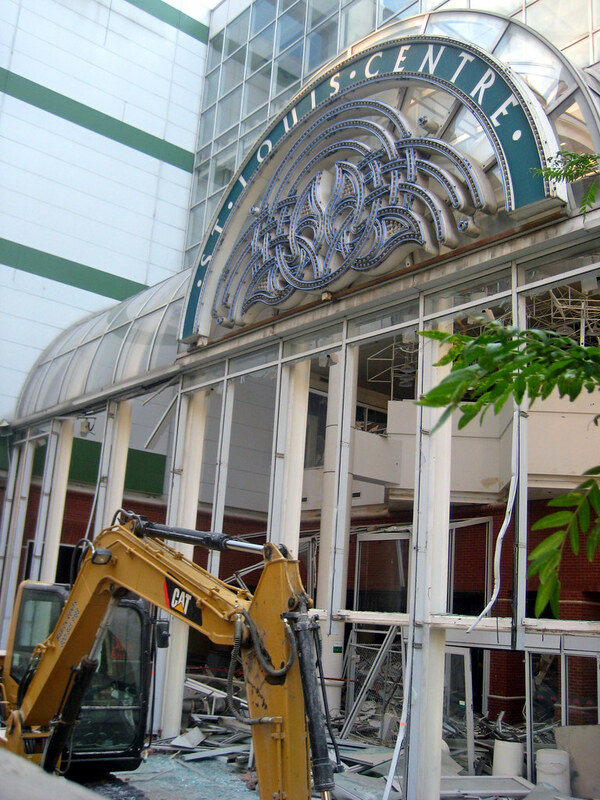 It's twin at 6th and Locust had been destroyed recently as demolition crews began to dismantle the malls exterior. The remaining sign at 6th & Washington awaiting destruction early last week. Having heard that the smaller version of the Lindy Squared mural had been salvaged for re-installation elsewhere, I was surprised that no one had taken notice of the large lighted signs. I contacted the Building Arts Foundation, and they were interested in salvaging it for their collection, but lacked the funds to do so. I then called local artist Bill Christman, who also did not have the means to salvage it. Some individuals who are trying to start a sign museum were also called, but they thought the sign was to "new". Finally I had a friend contact Bob Cassily at City Museum. Surely he would be interested, right? No, he said it should be ceremoniously destroyed. ago so that debris from interior demolition could be easily removed. Like most everyone else, I am thrilled that the hulking sky bridge is now gone over Washington Avenue and look forward to the same at Locust. It is frustrating however that many people do not recognize more recent parts of our lives as being part of history. Even the National Register of Historic Places says that a building should be "generally at least 50 years old" to be considered historic, although they will consider properties that have "achieved significance within the past 50 years if it is of exceptional importance". 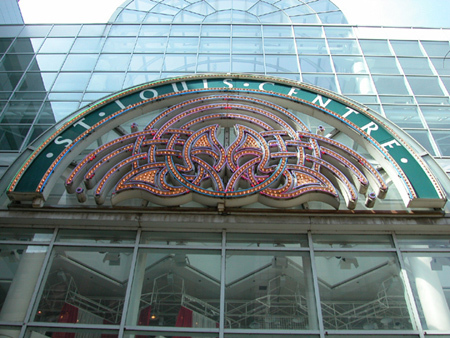 It is convenient for people to say that we should completely forget that St. Louis Centre ever existed. They would rather not admit that we collectively took part in something that was in the end a failure.